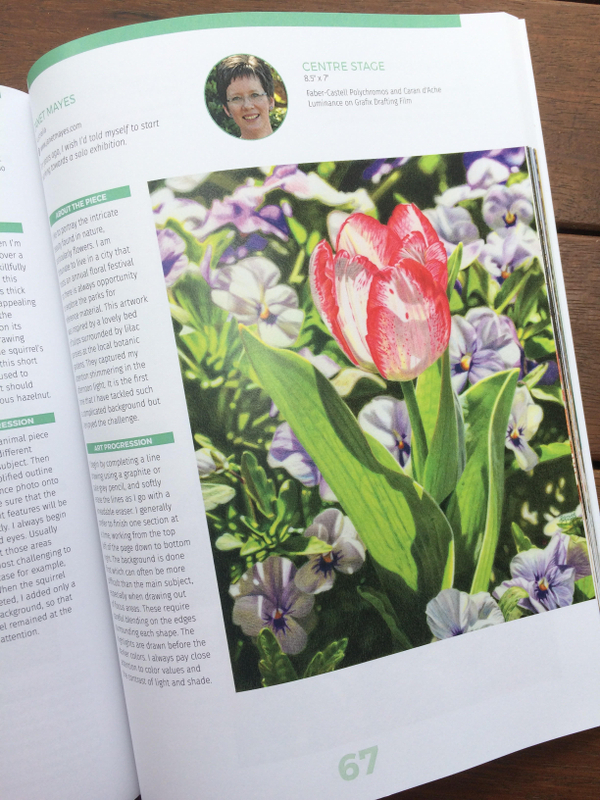 My latest artwork “Centre Stage” was completed a few months ago and was inspired by a beautiful bed of tulips and pansies at a local park – they captured my attention shimmering in the afternoon light. It is the first time that I have tackled such a complicated background but I enjoyed the challenge, especially in drawing the out of focus areas. These require careful blending on the edges of each shape. 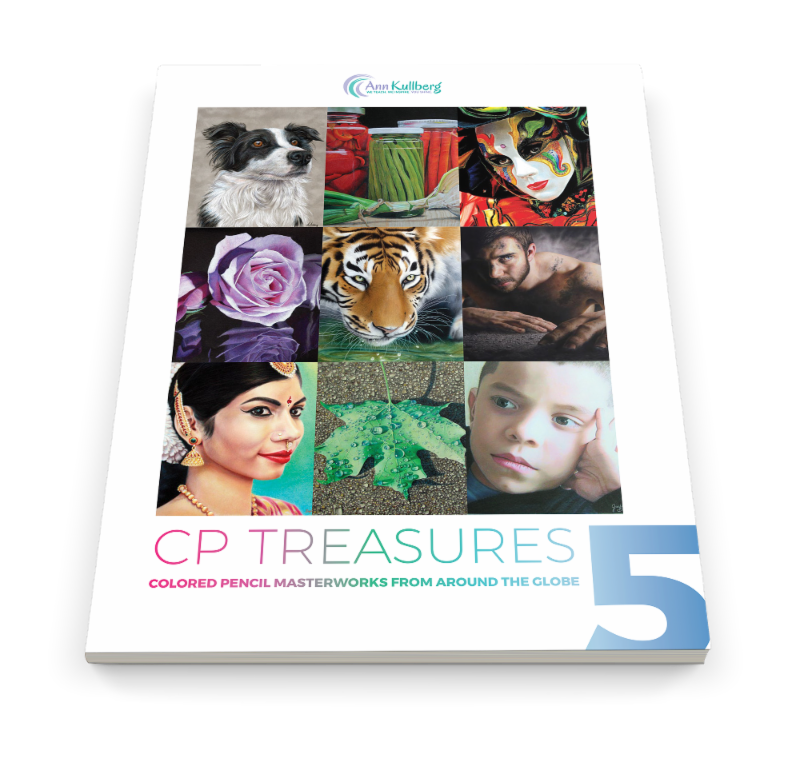 My drawing was selected to be published in the 5th volume of “CP Treasures: Colored Pencil Masterworks from Around the Globe” which was released earlier this month. It is an amazing compilation of coloured pencil works from artists around the world and the book features a wide variety of subject matter utilising different techniques and surfaces. If you would like to purchase a copy you can go to Ann Kullberg’s website here. I also entered this piece in the Australian Society of Coloured Pencil Artist’s Annual Colourbrations Exhibition and was thrilled to receive an “Honorable Mention”. You can view the online exhibition and award winners here. I was asked to contribute a short article to their December newsletter. I’m looking forward to the year ahead – I have started on my next floral piece and then I hope to try some different subject matter and attempt some still life pieces. Happy New Year! 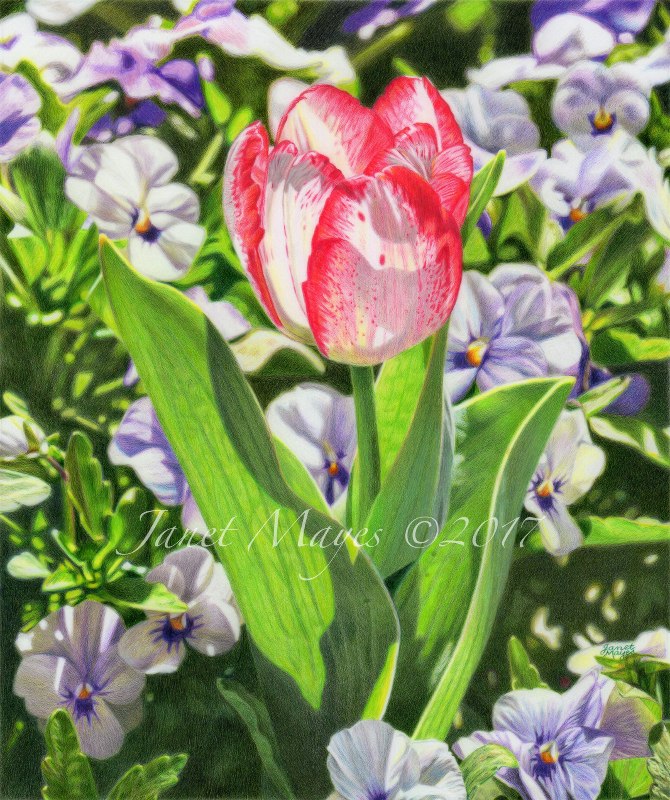 This entry was posted in Floral and tagged Ann Kullberg, Caran d'Ache, colored pencil, coloured pencil, drafting film, drawing, Faber-Castell, Luminance, Polychromos, Tulip on December 31, 2017 by janetmayes. Happy New Year to you too Janet. Your work is amazing as always. I hope 2018 brings you health & happiness & of course exciting art. Thank you Kaylene! Best wishes to you for the year ahead!